"I have been using the New World Repertory on a daily basis. Modeled after the Boenninghausen repertory, the NWR is similarly focused on physical symptoms, with the addition of rubrics specific to animal problems. Initially I thought it would just be applicable to my animal patients but have found it to be more concise and less bulky than many repertories, making it my first choice when initially repertorizing a case, be it animal or human. 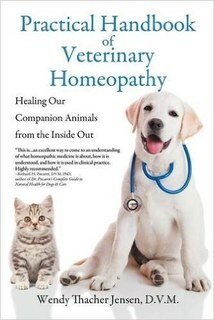 This repertory is a must for anyone who treats animals with homeopathy!" "I refer to your new repertory daily in my busy practice, and it has become my default reference when solving cases. Thanks to Richard and Wendy for all the labor involved in producing this great and useful tool for us to apply in practice." 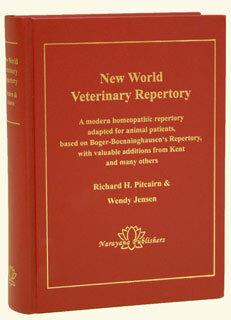 "The NWVR has been invaluable in my homeopathic veterinary casework for both acute and chronic prescribing. This repertory is tailored for veterinary use by including applicable descriptive rubrics for symptoms we'd most likely see in our animal patients. Another helpful tool are the extensive cross references and inclusion of concomitants that can help refine an obscure symptom." „I’ve been using this repertory since it came out a few years back, but in the digital version. It was carefully written from great source material on a great backbone (Boger-Boenninghausen, primarily), and painstakingly cleared of rubrics that are of no use to me in my animal patients. I can’t know anything about sensations, for example, because I can’t ask my patient what something feels like. Drs. Pitcairn and Jensen painstakingly searched several reliable references to be sure that rubrics chosen were of clinical utility in animal work. Practitioners themselves, their bent was to make this repertory eminently useful. The result is a finely honed, well organized tome that saves the busy practitioner time in his work, while broadening his understanding of what symptoms may apply to his case. The extensive cross references help me find rubrics that more accurately describe what I’m seeing in my animal patients. Amazing although many of these remedies and rubrics are found in other repertorys. The one thing I love about this beautiful designed book is the layout, for example the chapters are finger reference indented into the page side of the book. So you will see the mind, vert, eyes, etc going down the body list. I also Like the fact that it finished with the gereralitys to. This makes more sense as I don't need to go looking inside for them. There are a lot of gems I've found in the Reperatory and that's only since I bought it a month ago. So many perfectly clear references to Cancer, Tumours -various kinds.